In defiance of their own name the publishers have not put out this fancy volume simply for reading. 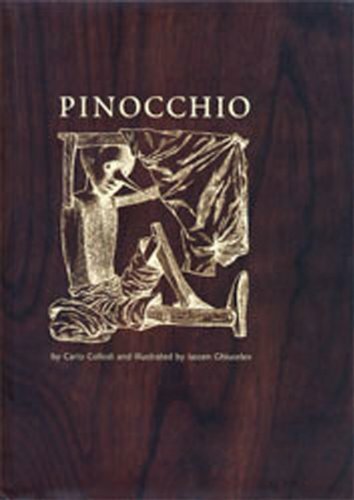 Like one or two other recent editions of Pinocchio, it's an exercise in de luxe bookmaking: a handsome imperial octavo in quarter linen, the rich red paper boards protected by a wood-grain paper jacket, all acting as a showcase for the artwork of its Bulgarian illustrator. Pen-drawn initials and vignettes and full-page - sometimes double-page - colour plates bear witness to sophisticated, virtuoso artistry, all beautifully printed. Gestures, physiognomies, props and costumes are handled with an almost photographic verismo which is offset by some artyfarty design-work and angles of perspective. That certainly doesn't make for a book intended to be 'simply read' and there's not much evidence that the publishers care tuppence for Collodi's story. For one thing they have merely tinkered about with a not-very-good translation that dates back to the 1920s (nowhere acknowledged in the book itself) although it looks as though Mr Ghiuselev was using a more accurate text since he illustrates what Collodi says rather than the translator's version. For a second thing Pinocchio does not need such pomp. As a story it is of the earth, earthy both in the vigour of its narrative and its language - a story for telling. Its folktale simplicities and its comic satire are obscured rather than enhanced by the glitz of what looks very much like an artistic ego-trip.